WOU has launched the George Town Institute of Open and Advanced Studies (GIOAS) in January 2019 for the advancement of openness to forge a more knowledgeable and harmonious society. GIOAS aims to attract leaders and thinkers from diverse fields and backgrounds to come together to deliberate over ideas for such advancement, starting off with its inaugural public forum on the “Role of the University in a Digitally Disrupted Age”. Tan Sri Dr Koh Tsu Koon and Tan Sri Andrew Sheng flanked by WOU Sdn Bhd Chairman Dato’ Seri Stephen Yeap (right) and WOU Acting Vice Chancellor Prof Zoraini Wati Abas. Speaking at the press conference in the main campus today to explain the setting up of GIOAS, Board of Governors Chairman Tan Sri Dr Koh Tsu Koon stated, “"Like all universities around the world, there are many challenges on how to upgrade the university as an institution that evolves with the times. Education is shifting from teaching students to follow instructions to preparing them to think and solve problems not just for themselves, but for society as a whole. With new tools that technology offers, WOU is revamping its own preparedness to deliver good education for all at affordable prices." He said that in the face of new challenges, particularly from Industry 4.0, WOU is in the midst of transforming to ensure it continues to deliver flexible, affordable and accessible education and becomes a top university. Dr Koh (left) addresses the press conference as Tan Sri Andrew Sheng looks on. 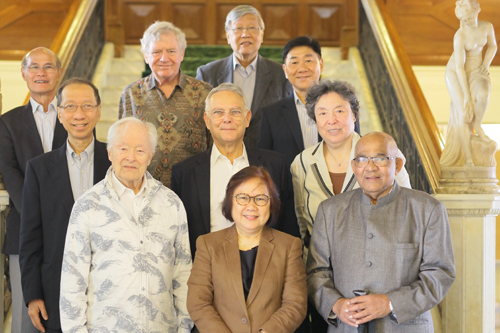 GIOAS’ International Advisory Board (IAB) Chairman Tan Sri Andrew Sheng, who is a Distinguished Fellow of Asia Global Institute, University of Hong Kong, and former Chairman of Khazanah Research Institute, shared about the Board members who are highly respected academicians and thought leaders from across the globe. · Dr Douglass Carmichael, physicist, humanist, psychoanalyst, entrepreneur and economic advisor to the Institute for New Economic Thinking (INET); former Professor at University of California, Santa Cruz. · Dr Stephen Oppenheimer, British geneticist and author; honorary fellow, Liverpool School of Tropical Medicine; trained in medicine at University of Oxford and University of London. · Dr Yaga Venugopal Reddy, former Governor of the Reserve Bank of India (RBI); Visiting Fellow, London School of Economics; and Honorary Professor, Centre for Economic and Social Studies, Hyderabad. · Dr Shiu Man Fai, former Consultant Cardiologist, Royal Free Hospital, London. · Ms Wang Yuan, former Chief Economist, China Development Bank, Beijing, the largest development bank in the world. · Mr Jan Wouter Vasbinder, Founding President, Institute Para Limes, Europe; former Director, Para Limes, Nanyang Technological University, Singapore. IAB members with Dr Koh, Prof Zoraini (front, centre) and Chief operating officer of WOU, Mr Yeong Sik Kheong (right, 3rd row). He added, “We are facing so many challenges brought by technology, geopolitics and climate change that we need to think about 21st century challenges using new lenses. This is why the Institute is OPEN, and draws in people who are advanced or who are working at the cutting edge of thinking or working on these issues." 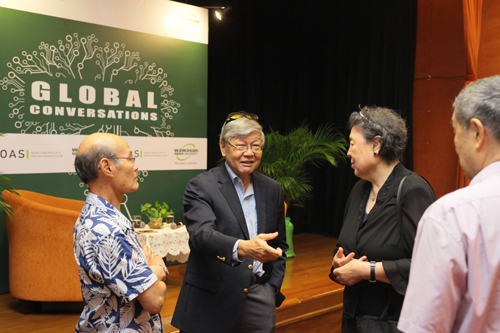 Tan Sri Andrew Sheng converses with Dr Shiu (left) and Ms Wang. He stressed that GIOAS offers an exciting platform for dialogue and discussion to open up opportunities for change.